A ventless dryer, or condensing dryer, is a type of dryer that uses tap water to dispel the heat from the dryer. This type of dryer is useful for homes that cannot vent heat through outside sources, or for individuals who do not want an open vent leading to the outside of their home. Ventless dryers can also sit nearly anywhere where a drain pipe and electrical outlet are located. Unfortunately, ventless dryers also have several problems associated with their operation procedures. Most ventless dryers use cold water coils to remove the heat from the dryer and then dispose of the water through the drain pipes. This can create condensation on and below the dryer. If too much condensation is present, water pools may form on the ground. This can cause mold and mildew to form. It is important to wipe up any visible condensation quickly and to only use ventless dryers on hard surfaces. Because of the way that ventless dryers work, the humidity in the drying room is always high. This humidity is caused by the presence of cold liquid combining with warm air from the dryer. The humidity can aggravate health problems in those sensitive to humidity. Air in the laundry room may feel sticky or constantly wet. Although ventless dryers are more energy efficient, they have longer drying times than many vented drying systems. 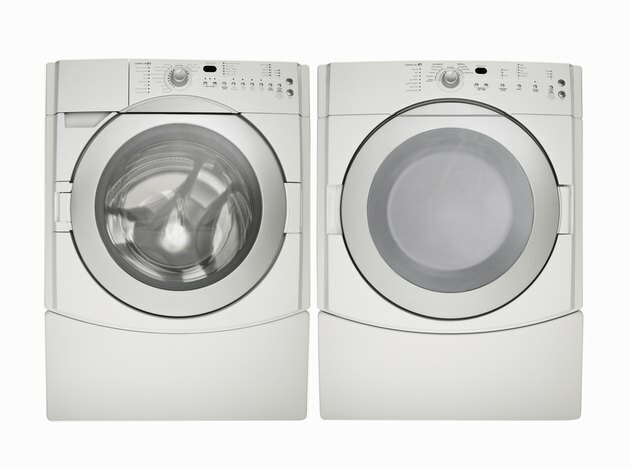 Most ventless dryers can dry only half of a normal washer load, which means that the dryer will run twice as often as a vented dryer. This cuts down on some of the energy efficiency that ventless dryers claim. Ventless dryers take a very long time to dry clothing. Some ventless dryers may take between 2 and 4 hours to dry a half load of clothes according to Natural Resources Canada. Because of this, it can take several days to wash a week worth of clothing. Because of the long drying time, many ventless dryer manufacturers recommend that laundry be washed and dried daily rather than weekly. Even though the energy costs for a ventless dryer are lower, there is a hidden cost to owning a ventless dryer. The ventless dryer takes tap water to distill the heat from the dryer. Water is used every time the dryer is operated. This will raise a homeowner's water bill. What Is the Maximum Length of a Roof Overhang? Why Is My Dryer Leaking?